You know how Sinful Colors used to do the same shades with different display names at Walgreens and Rite Aid? This year they seem to be switching that around. There are two different Bombay Nights displays, with slightly different selections in them. Both have the new-ish Copper Pot, which was originally in the big corner display at Walgreens over the spring. That thing never turned up around here, so I was really happy to finally get a bottle! Walgreens also got a brand new shade called Maroon Fine. (And the 99¢ sale is still on through tomorrow, 6/20.) Rite Aid got Ice Blue, which isn't new, but doesn't turn up often. Wegmans has the Rite Aid version too, plus some of these are on an endcap at Target. There's a nice assortment of rich, warm shades and bold blues in all of these displays. Hit the jump for a full list of the shades in both versions of the shelf display, swatches, reviews, and all of that. Maroon Fine is new, Copper Pot is new to me, and I also finally got around to picking up Cinderella. There are reruns of the rest after the new swatches. Copper Pot is bright metallic copper with tiny gold microfleck shimmer. Best one goes first this time! Holyshitgorgeous, right? Copper Pot is bright enough that it doesn't feel wrong in a summer collection, but it'll also be great for fall. The formula's really good. For shorter nails, one coat would probably be plenty. This is two. Had to add matte top coat...HAD TO! Maroon Fine is tomatoey orange-red with plenty of pink and gold fleck shimmer. The lighting must have been weird that day, because this isn't quite right. The wall and I both look greenish, but it's not far off for Maroon Fine. It's a little deeper in person, but also varies with the lighting. It's like magical tomato soup. Kinda weird formula on this one. It went on super thick, but one coat was still a little sheer. A second coat fixed it. Cinderella has dense pink-to-yellow shifting flecks in a sheer baby blue base. I think Cinderella has been in the core display for as long as I've been blogging, but I didn't own it until this week. Something told me it wouldn't look great on me. Brings out a lot of red in my fingertips. Shame, because that shimmer's lovely. This is two coats over Bright Lucite, which Valesha of Peachy Polish saw in the display at her Walgreens instead of Cinderella. Two birds with one stone in this swatch, right? There are also four reruns from my PGS days. Click the shade names to read the old posts. 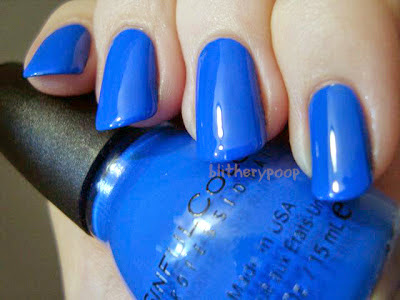 Endless Blue is a vivid blue cream. Skylark is a pastel orange cream. Ice Blue has intense blue flecks in a blue-tinted base. 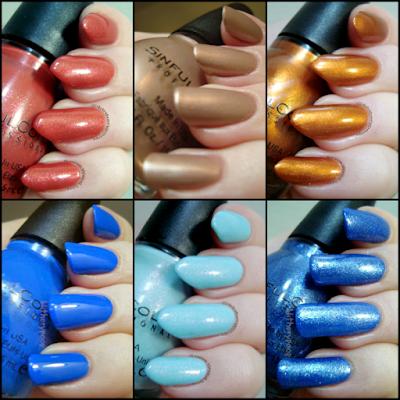 Flirting Nails is a metallic old gold. Bottom line: There isn't a bad shade in either display! 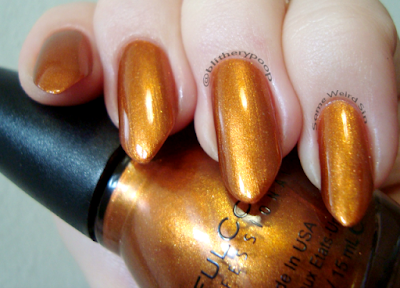 Copper Pot is a must-have if you're warm toned. Maroon Fine is a bit unusual, but eye-catching. Skylark would look great on someone with a tan. Ice Blue is intense and twinkly. I have all the shades this time around! Great way to kick off my first "normal" post, right?